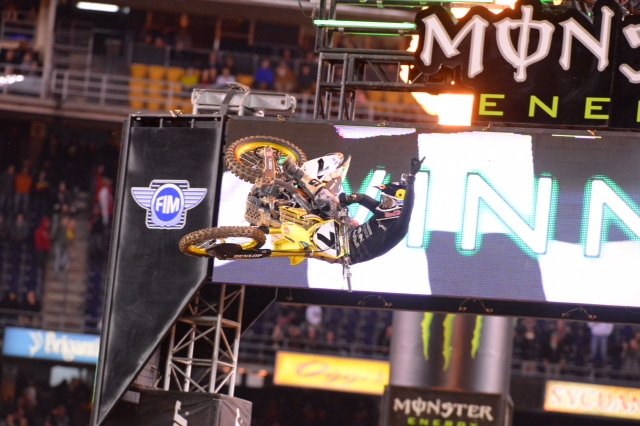 SAN DIEGO (February 8, 2014) – Yoshimura Suzuki’s James Stewart won his first Monster Energy AMA Supercross, an FIM World Championship, race of the season before 56,828 fans at Qualcomm Stadium on Saturday night at the first-ever Military Appreciation Race. Monster Energy/Pro Circuit/Kawasaki’s Justin Hill won the first Western Regional 250SX Class Main Event of his career and became the fourth different rider to win a race this year in the division. BTO Sports KTM’s Andrew Short led the field through turn one to start the 450SX Class Main Event to grab the Nuclear Cowboyz Holeshot Award®. Short was passed on the opening lap by Monster Energy Kawasaki’s Ryan Villopoto with Stewart in tow. Stewart then moved around Villopoto on the same lap. At the end of the first lap, Discount Tire Racing/TwoTwo Motorsports’ Chad Reed pulled into third place. Reed was passed on Lap 7 by Red Bull KTM’s Ken Roczen. Out front, Villopoto pressured Stewart throughout the 20-lap Main Event but was never close enough to attempt a pass. It was the 46th-career victory for Stewart and his first since Atlanta last season, 15 races ago. On the last lap of the race, Reed collided with Roczen’s rear tire and crashed while attempting to make a pass for third. As a result, Reed did not finish the race. Villopoto finished second, with Roczen in third. Villopoto now holds a nine-point lead over Roczen in the 450SX Class standings. Team Tedder/Monster Energy/Kawasaki’s Dakota Tedder won the first Nuclear Cowboyz Holeshot Award of his career to begin the 15-lap 250SX Class Main Event but was quickly passed by Monster Energy/Pro Circuit/Kawasaki’s Dean Wilson, who won last weekend at Angel Stadium. Troy Lee Designs/MAVTV Honda’s Malcolm Stewart moved into second place and Wilson’s teammate Hill followed in third place. On the second lap, Wilson crashed and dropped outside of the top 10. Just prior to the crash, Hill was able to pass Stewart for second and then assumed the lead. By Lap 6, Rockstar Energy Racing’s Jason Anderson, who came into the evening tied for the points lead, passed Stewart for second place. Hill led the remaining laps for the win, while Anderson finished second and Stewart finished third. Wilson re-entered the race to finish 21st. Anderson took over sole possession of the points lead and now holds a four-point advantage over Troy Lee Designs/Lucas Oil Honda’s Cole Seely. Monster Energy Supercross heads to Arlington, Texas’ Cowboys Stadium next Saturday, February 15. Next weekend, the Eastern Regional 250SX Class Championship begins as the Western Regional 250SX Class riders are on a break until April 5 at Houston’s Reliant Stadium.